Facebook chief executive Mark Zuckerberg's vision for a less private Internet is slowly coming to fruition, a survey by the Pew Internet & American Life Project suggests. 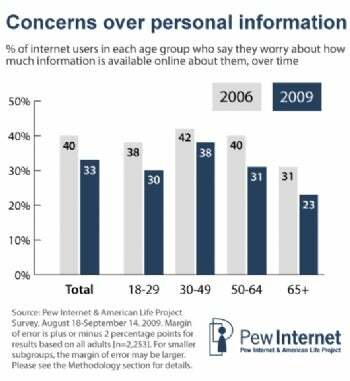 Compared to 2006, Internet users are now less concerned with the amount of information available about them online. Moreover, the percentage of people who take steps to limit this online information has dropped over the last three years. Across all age groups, Internet users are less concerned and less active with their personal information. Just 30 percent of 18-to-29-year-olds are worried about their online information, compared with 38 percent three years ago. 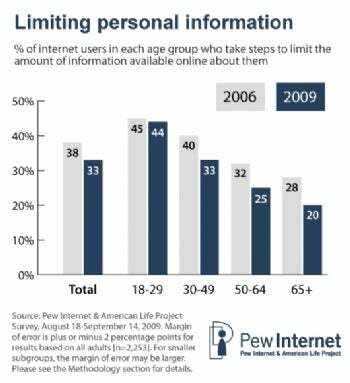 The same trend is happening with older folks: 8 percent fewer are concerned, and 8 percent fewer have taken steps to limit their online personal data. Young people are more proactive in guarding their privacy, Pew found. Late teens and twentysomethings are more likely than their elders to limit personal information available online, and that likelihood decreases with age. In the 18-to-29 age bracket, 71 percent of people said they've changed privacy settings on social networking sites, compared with 55 percent of people ages 50 to 64. Still, their views on privacy have also eroded over the last three years. The attitude shift has yielded an interesting and logical result: More adults than ever -- 57 percent compared with 47 percent in 2006 -- have looked up their own names in search engines. That's known as "egosurfing" in geek lingo, but Pew prefers to call it "reputation management," and says it's "a defining feature of online life for many internet users, especially the young." "To get people to this point where there's more openness - that's a big challenge. But I think we'll do it. I just think it will take time," Zuckerberg said. With his site under fire for pushing to make users' personal lives public, the question is whether Facebook can ride it out until that point.